Ⅱ. The Anhui Statistical Yearbook 2013 newly adds the annual average wage of employees of urban non-private units, the number of legal entity units of the non-public economical enterprises and legal entity units of middle and small-micro enterprises ; the basic situation of private education, archives work, family planning, sports lottery, welfare lottery; the main economic indicators of key enterprises of service industry by industry, the main economic indicators of the central 6 provinces of the national economy and social development etc. Ⅲ. 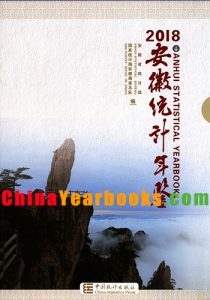 This book contains the following 24 parts and appendices: General Survey; National Accounts; Population; Employment and Wages; Investment in Fixed Assets; Production and Consumption of Energy; Finance, Banking and Insurance; Price Indices; People’s Livelihood; General Survey of Cities; Environmental Protection; Agriculture; Industry; Construction; Transportation, Postal and Telecommunication Services; Domestic Trade; Foreign Trade and Economic Cooperation; Tourism; Education and Science; Public Health and Social Services; Culture and Sports; Public Management and Others; Business Survey of Enterprises; Main Economic Indicators and Their Orders of Precedence for Provinces and Countries. The appendix includes: observation and survey of poor countries and basic situation of the whole province, organizational towns’ basic situation, and so on. To help readers further understand and make use of the data, each part is supplemented by a brief introduction and explanatory note on the main statistical indicators, introducing statistical coverage and statistical methods. Ⅳ. In 2012, We use the new classification of national economic industries (GB/T4754-2011). Ⅴ. The units of measurement used in this book are internationally standardized measurement units. Ⅵ. Notations used in this book: （blank space）indicates that the figure is not large enough to be measured with the smallest unit in the table, or data are unknown ,or are not available; “#” indicates a major items of the total. VII. Statistical discrepancies due to rounding are not adjusted in this book. Anhui Statistical Yearbook is compiled bilingually in Chinese and English and a magnetic CD-ROM has been published to form a complete set.